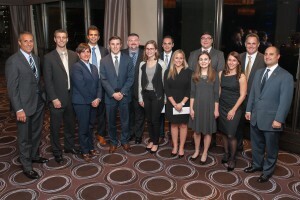 The Justinian Society of Lawyers Endowment Fund provides annual scholarships to needy Italian-American law students attending area law schools. Last year, the Justinian Society afforded 20 scholarships totaling in excess of $37,000 (including the law schools matching funds). The Justinian Society is primarily concerned with providing awards to qualified applicants demonstrating need and requires that applicants submit evidence of Italian ancestry. Certified transcripts of law school enrollment and grades, together with a black and white photo of the applicant must accompany the written application. All applicants are additionally required to indicate whether or not they previously have been awarded a scholarship by the Justinian Society of Lawyers. The scholarship committee accepts electronic submissions of the application and supporting materials by emailing one single .pdf to Anthony M. Farace at amp@amari-locallo.com by September 12, 2016.